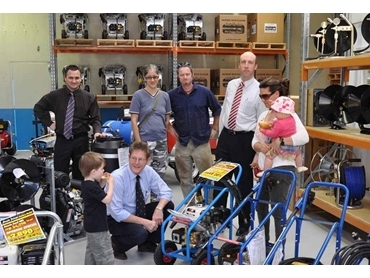 Jetblaster, a distributor for the premier range of high pressure cleaning equipment from Australian Pump Industries has opened a new factory outlet in western Sydney. The high pressure water blaster factory outlet is located at 5 Bearing Road, Seven Hills, and is set up to provide trade buyers with top quality equipment at great prices. Jetblaster’s Manager, Hamish Lorenz explains that by buying in bulk, and doing package deals, they are able to offer trade consumers such as brickies, roof restorers or pressure cleaning contractors some of the best deals in Australia. Jetblaster’s flagship Aussie ‘Scud System’ pressure cleaners are more than high pressure water blasters, providing a complete cleaning system designed to get jobs done faster, safer and more profitably for contractors, government departments or tradespeople. Jetblaster’s Aussie Pump’s factory outlet also stocks a wide range of accessories to enable packaged deals to be put together based on the unique Aussie ‘Scud System’. Buyers can select base machines in the 3,000 or 4,000 psi range, and equip them with high pressure hose reels and long length hose for more convenient pressure cleaning of plant and equipment. The pressure cleaning equipment can be further equipped with turbos, telescopic extension wands, flat surface cleaners and various labour saving equipment to get the most out of the machine. Lorenz adds that Jetblaster focuses on equipping contractors or cleaning professionals with the right kind of equipment that enables them to get more work done faster without any OH&S issues. All the cleaning machines on offer at the factory outlet have been through a rigorous risk assessment programme. Jetblaster also runs a fully equipped service station staffed by certified Aussie pressure cleaner technicians.